Welcome to the 49er Rally! 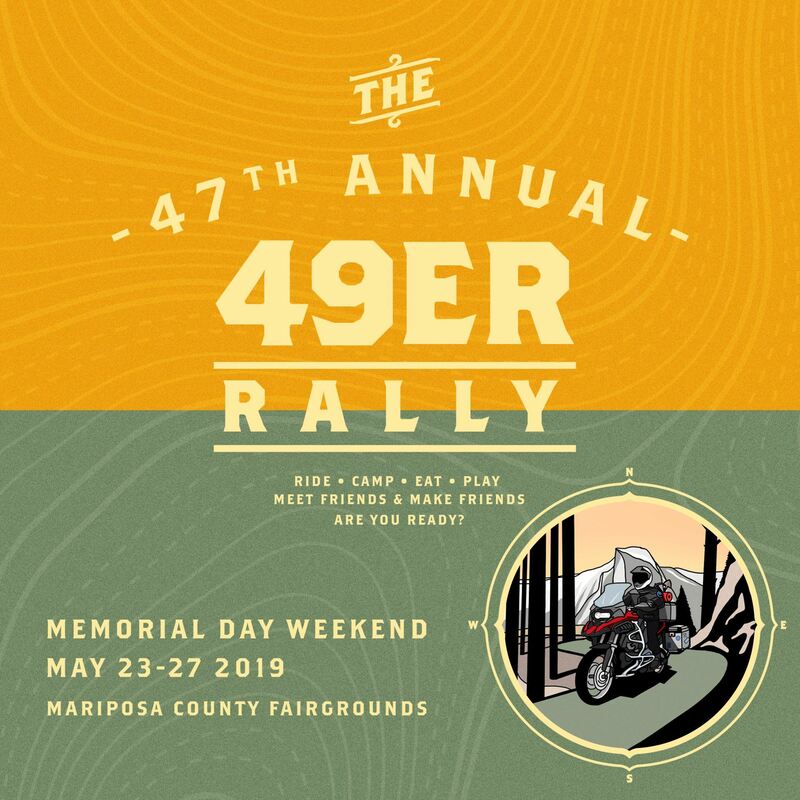 The 49er Rally is the BMW Club of Northern California's annual rally with 47 years of tradition and predating the BMW Motorcycle Owners of America's (MOA) National Rally. Last year we had over 500 Riders in attendance. Admission includes four nights of grassy camping, hot showers, great self guided GS and street rides, tons of events and seminars, live music, and a lot of fabulous motorcycle people! This is the best BMW motorcycle Rally of the year! Click here for a video of a past 49er Rally. Imagine 4 nights under star filled skies. Perfect T-Shirt weather. Nestled among lawns, shade trees and flowers, the tent camping inside the Mariposa fairgrounds provides a serene setting to relax after a ride. Electric and water hookups are available for RV’s! Restrooms and hot showers! Plus complimentary WiFi! Relax and unwind with plenty of great food, drinks, and live music! A few steps away is our Bier Garden with a great selection of adult beverages. Like music? We have live bands for your listening pleasure! This is your weekend! So you want to take a break from the rally and hop on your bike? You are in the perfect spot to explore California's Gold Country or the Sierra Nevada foothills! We offer great self guided road and GS routes for you to explore. Head out solo or sign up with others. Never a dull day on this 49er Rally! Interested in an overseas motorcycling adventure? Or perhaps want to know more about packing gear stuff efficiently? Looking to upgrade your lights, windshields, or need lighter equipment for your camping needs? The 49er has informative and riveting speakers and great vendors, often offering great Rally deals. Come see for yourself! Returning this year is the GS Trophy Course, courtesy of master course-builder Dennis Godwin and the GS Giants. Challenge yourself and test your skills on this larger than life course or watch all the action and cheer for your friends. Come learn or brush up on your off-road skills at our GS Clinic, lead by pro BMW trainer/coach Lance Thomas (Formerly of RawHyde Adventures.) Lance believes that proper off-road technique is born from proper training. To that end, he has created a curriculum designed to grant riders a simple, achievable ladder of skills. Challenge yourself! Don’t miss out on the traditional English Trials and the snail speed “Slow Race” events! Lots of fun! Sign -ups required. If you’re feeling lucky join us on the 50/50 raffles and the Poker Run! And don't forget about the loads of raffle prizes. Want to showcase your product or services? Get an indoor booth or an outdoor space. You'll have around 500 people checking you out! Want to get the most out of the 49er Rally? Join Our Team, Have a Blast! We are hard at work to make the 2019 49’er Rally another great success, but we can only achieve this with the army of fun-loving volunteers it takes to put on such a great rally. We appreciate any help you can give, so please consider volunteering. Click the link below to sign up.